Sezincote is unique. At the heart of a traditional, family-run estate covering 4,500 acres of rolling Cotswold countryside stands a 200-year-old Mogul Indian palace, set in a romantic landscape of temples, grottoes, waterfalls and canals reminiscent of the Taj Mahal. Vsitors are welcomed to the house and garden at the set opening times, and a very few special weddings are hosted every summer. Sezincote sits at 875 feet above sea level in the North Cotswolds. The House is still privately owned and remains the centre of a thriving agricultural estate, which provides resources both to maintain the house, and to sustain the complex tapestry of rural life. Sezincote remains a genuine ‘family affair’ with a brother and sister team managing the house and estate respectively with continued support from the older generation and some engaged interest from the younger. The Estate is run to traditional English standards, with a mixed farming enterprise allowing plenty of permanent grassland and proper fencing, complemented by well managed woodlands that provide not only timber but also good wildlife habitat. The House, however, is far from traditional - it was built in the “Indian Style”, a unique combination of Hindu and Muslim architecture. The gardens were designed with the help of Humphrey Repton. Sezincote is credited with influencing the design of the Brighton pavilion after a visit by The Prince Regent in 1807. "Gardens Near and Far" by Jean-Philippe Teyssier (English subtitles) Arté TV 27 mins. Nothing quite prepares you for Sezincote. After winding through the mighty oaks that line the long drive of this Gloucestershire garden on the edge of the Cotswolds, you see a weathered-copper onion dome straight out of India. The south front, complete with curving orangery, unfurls above a Repton landscape that has remained unchanged since the mid-19th century. The garden is blessed by a series of spring-fed pools, connected by gurgling water which eventually tumbles into the Island Pool in the valley bottom, before joining the River Evenlode below. Sezincote is a theatrical and magical summer venue and hosts six weddings a year. The only authentically Mughal palace in northern Europe, the house was built in the Indian style in 1805 and was the inspiration for Brighton Pavilion. 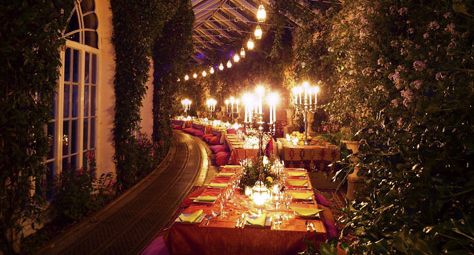 Perfect for a wedding celebration, this exotic house truly takes your breath away. It is a uniquely romantic hidden jewel with its onion dome, minarets and curved Orangery enclosing a Persian Garden of Paradise set amongst the green Cotswold hills. Sezincote Farms is a family partnership that is now on its third generation. We farm just under 2,000 acres in the North Cotswolds. The farm lies between Moreton-in-Marsh and Stow-on-the-Wold, 3 miles to the west. The farm consists mainly of cotswold brash on the higher ground where most of our arable enterprise is concentrated and clay loam on the lower ground where most of our permanent pasture is and where the cattle graze from April to November. We have a range of properties to rent at Sezincote from larger, 6 bedroomed farm houses through 3 bedroom cottages to quirky 2 bedroom period cottages. These do become available periodically. The majority of property for rent are either in the heart of Sezincote Estate itself or in the neighbouring villages of Bourton on the Hill and Longborough. There is a very small collection of commercial property to rent at Sezincote, including offices, shops and storage facilities.